Long hours, grueling work and often underappreciated, working as a nurse is a critical job, and nurses are the backbone of our healthcare system. These healthcare T-shirts make a great gift to show your appreciation, or a great purchase to take pride in your vital career. 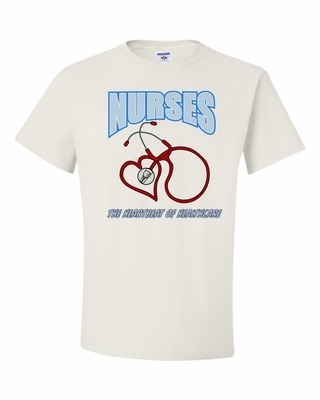 These Nurses Are the Heartbeat of Health Care T-shirts are stylish, comfortable and true. Nurses help save lives every day, so show your appreciation or take pride in your work with these healthcare T-shirts. Remember� you found the Nurses-The Heartbeat of Healthcare Shirts at TShirtHub.com, where high quality came at a low price.